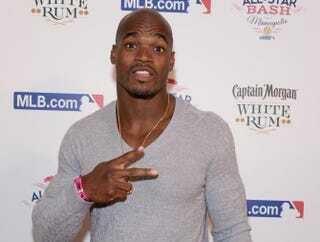 Adrian Peterson of the Minnesota Vikings attends the MLB.com All-Star Bash at Epic in Minneapolis on July 13, 2014. On Monday afternoon the Minnesota Vikings announced that they were reinstating running back Adrian Peterson after deactivating him one game because of child-abuse charges he faces for reportedly beating his 4-year-old son with a switch. By Monday evening a second report of alleged child abuse had surfaced, according to news station KHOU. Mother: "What happened to his head? Peterson: "Hit his head on the Carseat". Mother: "How does this happen, he got a whoopin in the car"
When the boy's mother reportedly asked, "What did you hit him with?" Peterson did not respond. According to KHOU, the mother filed a report with Child Protective Services shortly after the incident, but no criminal charges were filed.